Today in awesome things that you missed and are now gone forever: In 2011, director Jason Reitman started a live read series at the Los Angeles County Museum of Art (LACMA), in which well-known actors do a table reading of a beloved film for a live audience. Past entries have included classics like The Apartment, The Breakfast Club, The Princess Bride, Ghostbusters, and The Big Lebowski. The films are not known in advance to the audience, so 600 lucky ticket holders got a pleasant surprise this past Thursday when a star-studded cast was on hand to read Pulp Fiction. 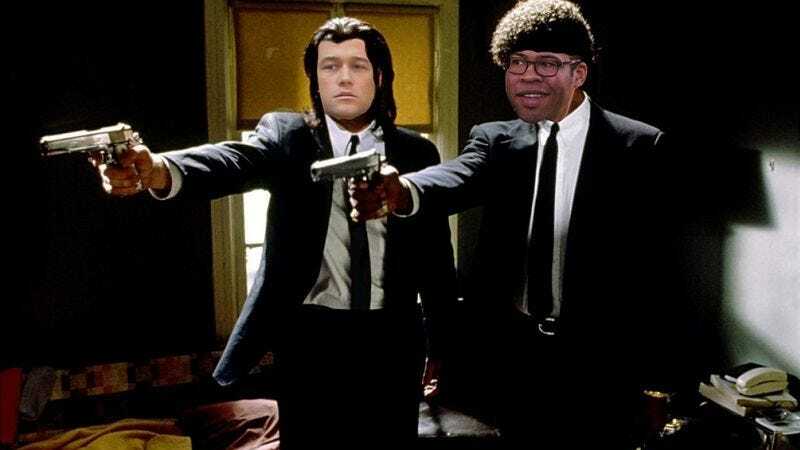 Jordan Peele and Joseph Gordon-Levitt played hit men Jules and Vincent, respectively, and they came dressed for the part. Lizzy Caplan read for Mia Wallace (and got up to dance with Gordon-Levitt for the twist contest scene). Wendell Pierce played gangster Marcellus Wallace. And, in the unlikeliest pairing, Jonah Hill filled Bruce Willis’ shoes as prizefighter Butch. The rest of the cast played multiple smaller roles, with Seth Rogen playing drug dealer Lance, redneck shopkeeper Maynard, and over-caffeinated homeowner Jimmy. Michael Chiklis got to show off the most range, playing the timid, big-brained Brett and cool customer The Wolf, and he also got to deliver the “gold watch” monologue made famous by Christopher Walken. Rebecca Romijn showed off two different accents as cabbie Esmerelda and Butch’s French girlfriend Fabienne. And Nick Kroll played more or less the rest of the minor characters, including Marvin, Zed, Jackrabbit Slim’s Ed Sullivan-impersonating host, and even the Gimp. Tickets are already on sale for the next live read in March. Rest assured you will probably miss it, and then it will be gone forever.